On the 12th, I decided enough was enough. I’d been stuck in the house for TOO LONG and I needed to get out – even if I had to drag the Geekling down a flight of stairs and around the massive apartment building and across the street to where my car sat, forlorn and alone, because the folks here are “fixing” our parking garage. Ugh. I loaded him up (Why do babies require so much stuff? Diapers! Wipes! Spitup rags! Etc, etc, etc…) and off we went. Our destination? The LIBRARY! Now it’s come to my attention recently that our local library, the Rose Garden Branch of the San Jose library system, is only open on Mondays, Tuesdays, Wednesdays, and Thursdays. How much utter crap is THAT! I can’t go on the weekends anymore, when The Hubby can help me haul around the baby stuff…noooo it has to be on the weekdays during the day while I’m by myself. Yikes! Everlost by Neal Shusterman – I’ve been wanting to read this one for a while and just kept forgetting to grab it. I finally remembered it when I was requesting books the other day, so I snagged it. I’ve already read this one, and I did like it. The Key by Marianne Curley – I didn’t realize until I got home that this book is the third in a trilogy. Oops! The library closest to me does not have the first two books, so I’ve requested them from other branches. Hopefully I’ll be able to get them soon and read them before this one is due back. Tender Morsels by Margo Lanagan – Another that I’ve been wanting to read for a while. It’s been on my “grab this when it goes on sale” or “snag from the library” list for a while and it was -finally- in when I went to grab the other books. Yay! Monsters of Men by Patrick Ness – I read the first two in this series last year before life went absolutely crazy around here. I’m looking forward to finally finishing the series, though I may need a refresher on what’s happened in the first two books. hopefully it’ll come back to me as I read. Vellum by Hal Duncan – This is actually rather new on my want-to-read list. I saw it at Barnes & Noble the other day while browsing with the Hubby and the Geekling. He expressed interest in reading it and it looked good to me as well, so I figured hey – why not. Across the Universe by Beth Revis – I actually borrowed this one before, but could not for the life of me make time to read it. Thankfully, I now can. I’m about halfway through it and liking it so far. Ms. Revis’s writing style is one that I can really appreciate. The Calligrapher’s Daughter by Eugenia Kim – Sounded good, grabbed it, the end! Ready Player One by Ernest Cline – Bree from All The Books I Can Read told me to grab this one. It’s about gaming & stuffs, and she liked it, and I usually like the things she likes ’cause we’re soul-sisters or something….so I got it. Because she said so. See how that works? Really, go read her blog. She’s got great taste. Saving CeeCee Honeycutt by Beth Hoffman – Just wanted it. Got it. Yay for that. The Tiger’s Wife by Téa Obreht – Bree told me to get it. Except…for different reasons this time. So, we’ll see! The Children’s Book by A.S. Byatt – I don’t even remember why I wanted this book, but I do recall seeing it at B&N one day, wanting to read it, and not buying it because I have a problem with commitment. So, yeah, borrowed it. 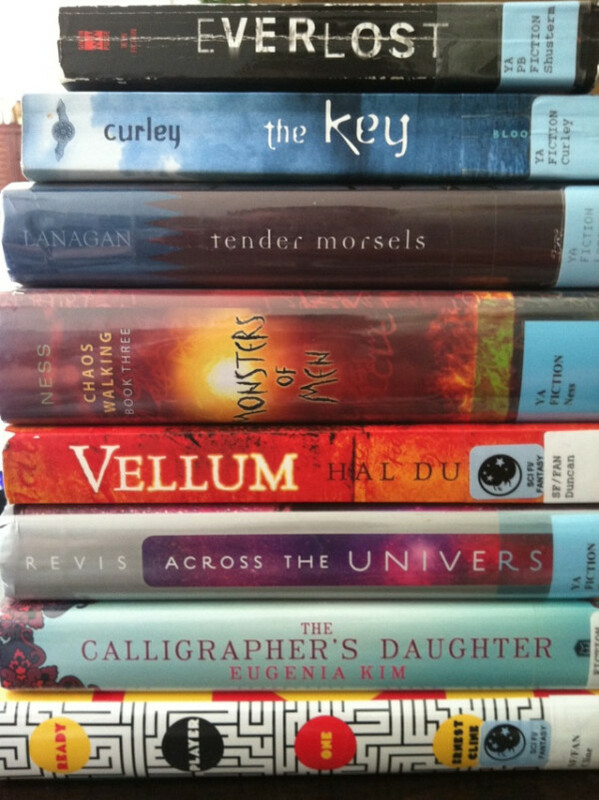 Random Middle of the Post Challenge: I dare you to go to your local library and borrow something. Spread the library love and borrow some beautiful books. Hug a librarian or something. After you do that, come back here and tell me about it. What you borrow doesn’t matter – a novel for the pure enjoyment of reading, a how-to book because you need to fix that drippy faucet, a picture book for your little one to coo over – whatever. Doooo it! I think I’ll be busy for a while…especially since I can no longer read a book a day. Strange how I thought I’d still be able to do just as much reading with an infant in the house as I did before. Guess I learned my lesson -again- about assuming things! I will be reviewing most of these books. Be joyful!